This article was originally published on Civilnet.am on November 6, 2015. 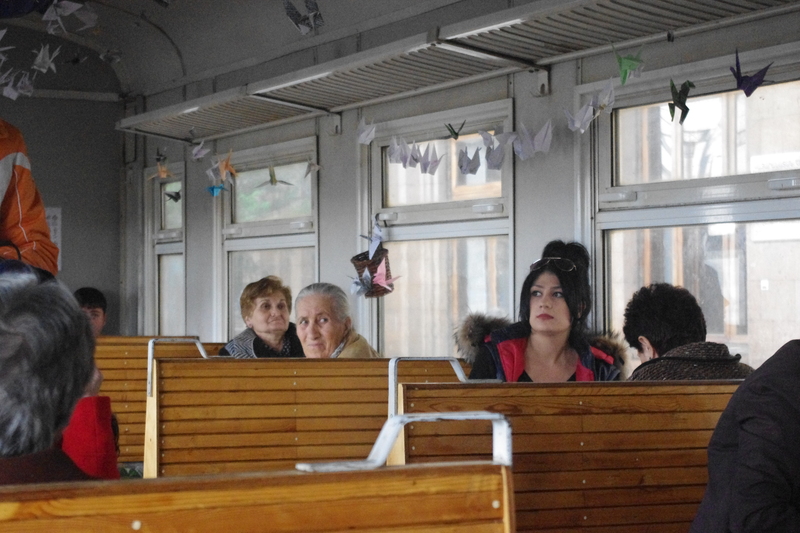 Last Thursday, passengers climbing onto the Gyumri-bound afternoon train in the Sasuntsi Davit station in Yerevan were surprised to find their usual ride completely transformed. The second wagon of the 14:30 train had been turned into a colorful “nest,” with thousands of origami cranes hanging from the ceiling. Thanks to HAYP Pop Up Gallery’s active advertising on social media, many of those who stepped onto the train had come specifically to see this installation and the associated performances. But on that day, most travelers hadn’t heard about the art installation and looked around in bewilderment. For the opening train ride, the public’s reaction was therefore the main question mark for the organizers – and I happen to be one of them. 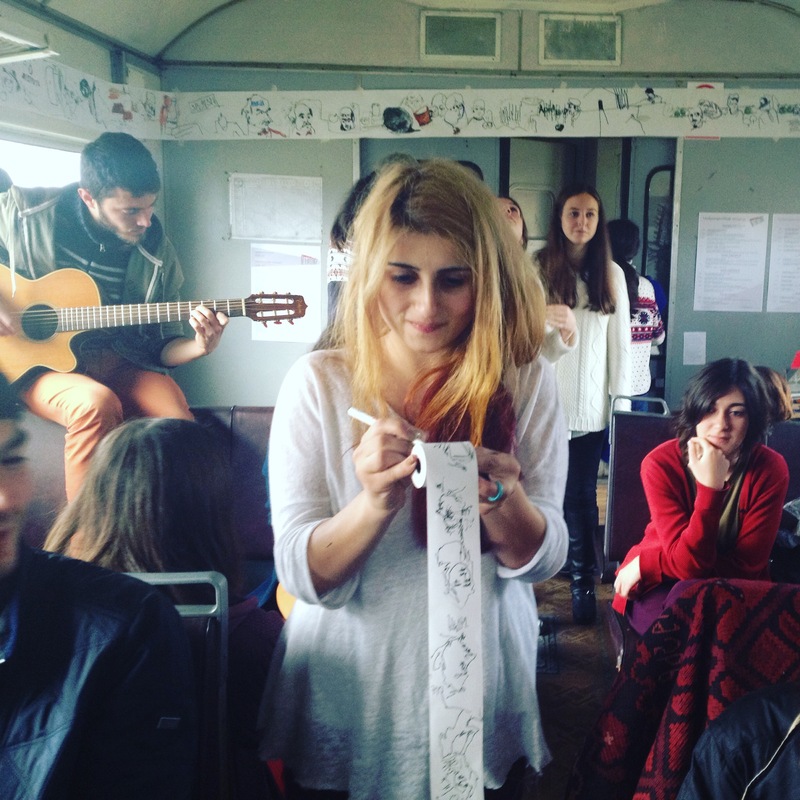 “This artistic take-over of the Yerevan-Gyumri train had been stirring in our minds for quite a while” says Anna K. Gargarian, HAYP Pop Up Gallery’s co-founder. The Soviet-era train has a characteristic old-fashioned charm to it, and seemed to us like a perfect location for an ephemeral art installation. 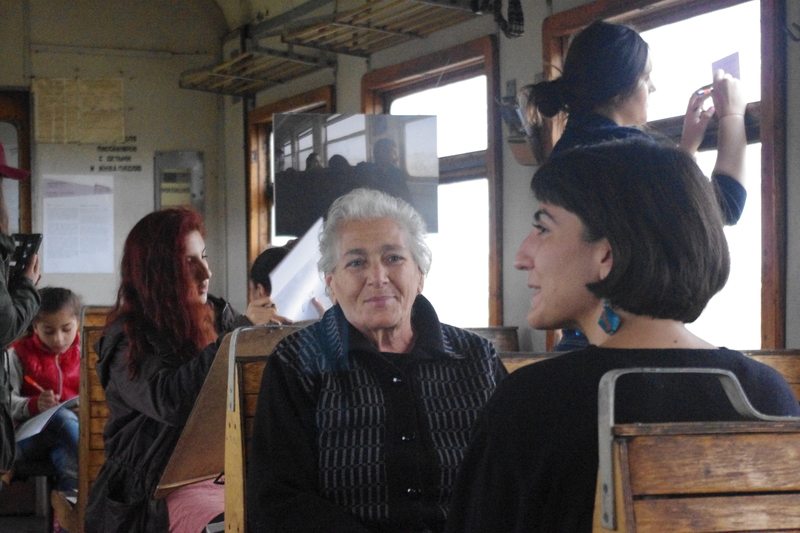 We acted on that idea and organized “In Motion,” an art installation and series of performances in the Yerevan-Gyumri train, from October 29 to November 1. This was HAYP Pop Up Gallery’s largest project so far, with more than forty participating artists and performers. The South Caucasus Railway gave us permission to set up a temporary art installation in three wagons of the trains linking Yerevan and Gyumri. 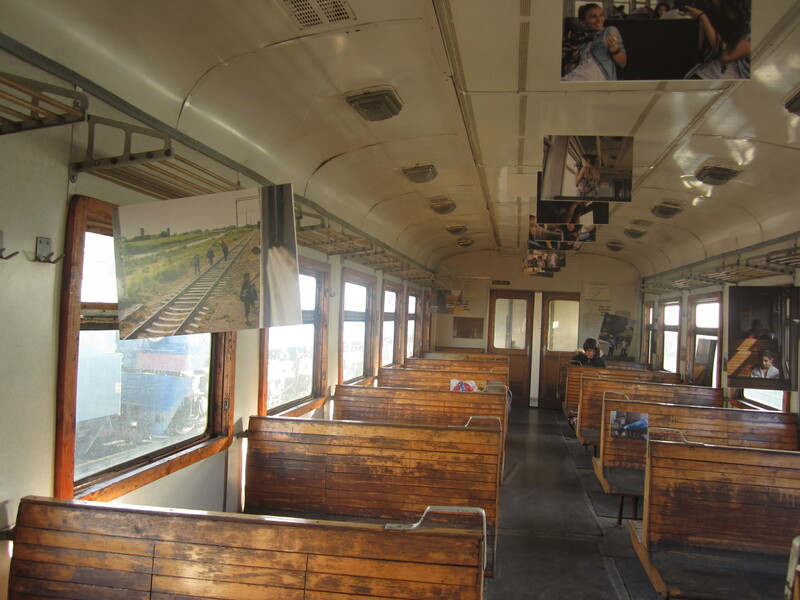 Each of the three wagons had a specific art installation to it, and hosted different performances – from contemporary dance to acoustic concert, opera singing and performance art. The art installation in “The Nest” was the result of collaboration between artist Lilit Markosian and the HAYP team. A thousand paper cranes were suspended from the ceiling, symbolizing hope and peace.Ancient Japanese legend has it that folding 1000 paper cranes brings good luck, good health, or grants you a wish, according to different versions of the story. They have also come to symbolize peace through the story of Sadako Sasaki, a young Japanese girl who was diagnosed with leukemia as a result of the Hiroshima atomic bombing, and attempted to make one thousand paper cranes in the hope to recover. In this ephemeral traveling installation, train passengers were invited to leave positive wishes in their own origami cranes that they could add to the sky of birds. “218 Minutes: A Moving Snapshot” was curated by TUMO Center for Creative Technologies. All the photographs featured in that wagon were taken by TUMO students last summer, as part of a photography workshop led by international food photographer John Lee. We organized “In Motion” with three specific goals in mind. First and foremost, we wanted to bring more tourists and business to Gyumri, Armenia’s second city. In the past, we collaborated with several artists from Gyumri, and always appreciated the cultural and artistic wealth of the city. This time in particular, we wanted to bring as many people as possible from Yerevan to Gyumri to see the fantastic “Luys i luso” multimedia installation. The “Luys i luso” installation, a three-dimensional immersive experience based on Tigran Hamasyan’s performances in ancient Armenian churches both in Turkey and Armenia, was to be shown only in Gyumri, from October 29 to October 31. We also wanted to reach out to people who don’t usually go to gallery openings – bring art directly to the people, instead of telling them to go and see it. Finally we wanted to add a little spark in the traveler’s journey, make the train ride memorable, and encourage spontaneous conversations between passengers. Passengers had many questions for the organizers; those four ranked as the most frequently asked. In the context of a pop-up gallery, effective mediation is essential, so that the art can be made accessible and comprehensible to the public. We had chosen an unexpected place for an exhibition, so we took the time to go to each passenger and explain the concept; who created the art installation, what it was about, and what kind of performances would take place during the ride. Some of the performances were straightforward enough, and were an instant hit amongst passengers. On Thursday and Saturday, Achod Papasian and Marisol Khadeyan both played acoustic guitar. 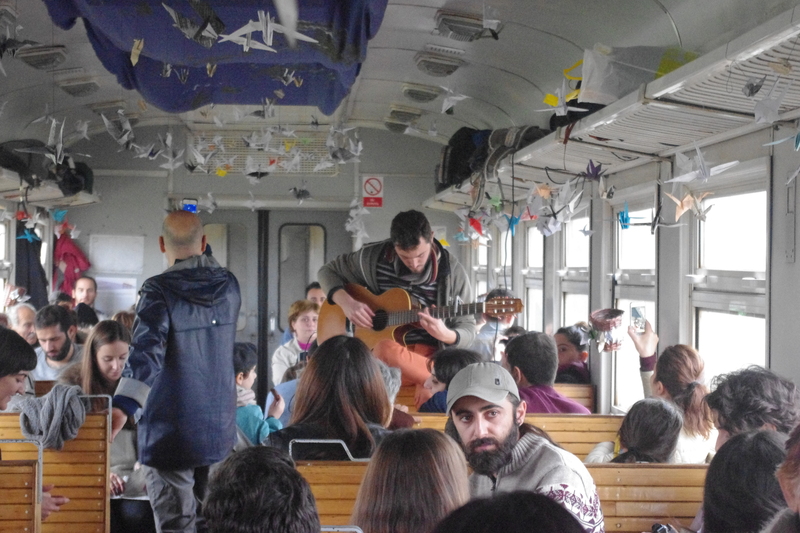 On Saturday morning, with an accordion, a guitar and traditional Armenian songs, “Sevana & the Boys” transformed a commonplace wagon in what can be best described as the ultimate “kef.” Passengers actually came in from the other wagons to join in the chorus. Other performances required more a more substantial mediation effort. For “In Motion”, HAYP Pop Up Gallery collaborated with artist Barbara Karsh-Chaïeb from Germany, currently completing an art residency in Yerevan. Her performance “Train Office” (a meeting point for ephemeral memories) was an interactive piece that greatly intrigued train passengers. Armed with a little cardboard box of blank cards, Barbara Karsh-Chaïeb approached travelers with a seemingly simple question “what is luck for you?” Participants could write one or more sentences on a blank index card, and reflect on the cards that were already collected. 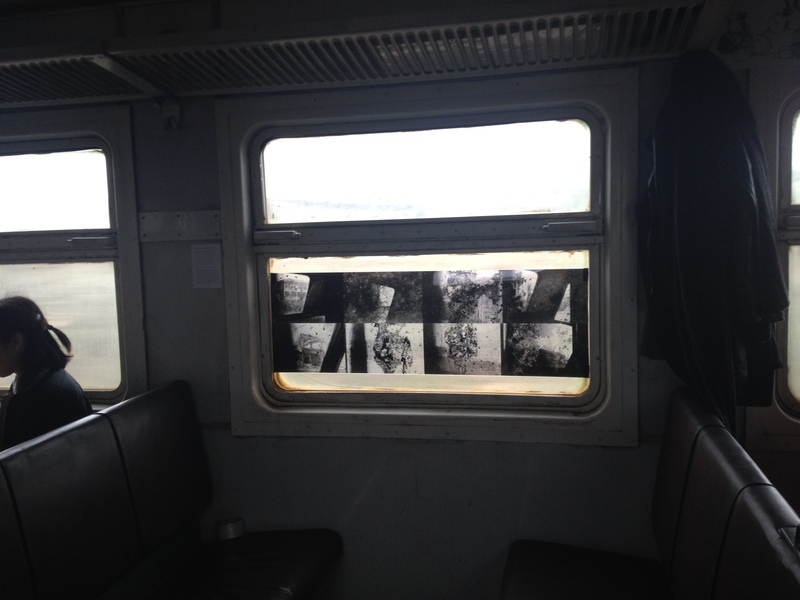 It is fair to say that most (if not all) passengers were a little nonplussed by the question, and by Barbara Karsh-Chaïeb’s enterprise; when was the last time you were approached by a German artist in an Armenian train? If they were surprised, most of them still happily participated. At the end of her third train ride, Barbara had collected more than 50 index cards, written in Armenian, English, French, German, Russian and Spanish. The experience seems conclusive; at least two hundred people took the train that weekend specifically to participate in In Motion. Among the usual passengers, the reactions were overwhelmingly positive. Some really liked the contemporary dance performance executed by BA-AR-DIA; others were charmed by the live-sketching performance by students of the Fine Art Academy of Yerevan. In “The Nest,” many travelers asked for instructions to make their own paper cranes and add them to the origami installation. In « 218 minutes », passengers were delighted to recognize some of their friends, relatives or neighbors on the pictures. All in all, seeing the reaction to “In Motion” comforted us in the belief that art has the transformative power to build bridges between people and bring communities together.